Objectives: The Physics Laboratory is situated at the top floor of the main building of Narula Institute of Technology. 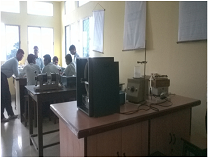 The laboratory course is offered as PH191 and PH291 at odd and even semester to the 1st year B. Tech students. PH391 and PH491 are offered to the second year students at odd and even semesters. Contact hours for the laboratory course are 3 hours/stream/week/group. In the even semester, 1st and 2nd year students of Electrical Engineering (EE), Electronics and Instrumentation Engineering (EIE) and Electronics and Communication Engineering take PH291 and PH491 laboratory courses. In the odd semester, students of Computer Science Engineering (CSE), Information Technology (IT) and Civil Engineering (CE) take PH191 and PH391 laboratory courses for 1st and 2nd year respectively.